The European Union is still emerging as a fully fledged foreign policy actor. The vagaries of this process are clearly visible, yet insufficiently explained in the EU policies towards the post-Soviet space. EU Foreign Policy and Post-Soviet Conflicts examines EU intervention and non-intervention in conflict resolution, with a specific focus on the EU’s role in the post-soviet conflicts in the South Caucasus and Moldova: Abkhazia, South Ossetia, Nagorno-Karabakh and Transnistria. It explains how EU foreign policy affected these conflicts, but more importantly what EU intervention in these conflicts reveal about the EU itself. Based on extensive field research, the author argues that the reluctant EU intervention in post-Soviet conflicts results from a dichotomous relationship between EU institutions and some EU member states. 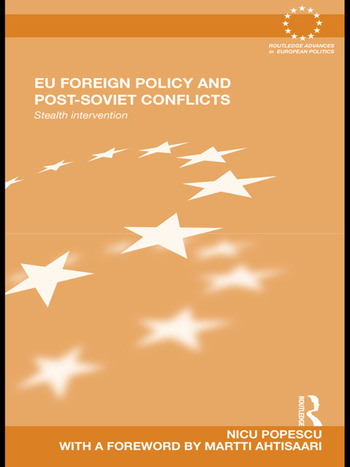 Popescu argues this demonstrates that EU institutions use policies of ‘stealth intervention’ where they seek to play a greater role in the post-Soviet space, but they do so through relatively low-profile, uncontroversial and depoliticised actions in order to avoid visible Russian opposition. Exploring an array of questions related to the EU as a foreign policy actor, this book traces the politics of conflict intervention by EU institutions using original empirical data related to the EU decision making process and will be of interest to students and scholars of European politics, conflict resolution, foreign policy and Post-Soviet politics. Nicu Popescu is research fellow at the European Council on Foreign Relations in London. He has worked as a senior foreign policy advisor to the Prime-Minister of Moldova, and researcher at the Centre for European Policy Studies in Brussels. Nicu holds a doctorate in political science from the Central European University in Budapest.